Jules Verne ATV is seen backing away from the International Space Station from inside the ATV Control Centre (ATV-CC) in Toulouse, France. Europe's first ATV undocked from the ISS at 23:29 CEST (21:29 UT) on 5 September 2008. A European cargoship the size of a London double-decker bus bid farewell to the InternationalSpace Station late Friday after five months docked at the orbiting laboratory. The EuropeanSpace Agency?s (ESA) space freighter Jules Verne, the first of a new fleet ofAutomated Transfer Vehicles (ATV), undocked from the station at 5:29 p.m. EDT(2129 GMT) to begin a leisurely, 23-day descent and destruction. Named afterthe famed 19th Century French science fiction writer Jules Verne, the $1.9billion (1.3 billion Euros) cargo ship will spend the next several weekstraveling to the proper orbit to begin its disposal by burning up in the Earth?satmosphere. Thespace freighter launched toward the space station on March 8 and docked inearly April after a series of rendezvous tests to deliver cargo and preciousmanuscripts written by its namesake author. Jules Verneis 32 feet (10 meters) long cylinder with a width of about 15 feet (4.5 meters)and hauled almost 8 tons of cargo - three times the amount delivered aboardRussian Progress spacecraft - to the space station. Since the cargo shiparrived, station astronauts retrieved its contents, usedits spacious interior as a washroom, used its four rocket engines to boostthe station?s orbit and filled the freighter full of unneeded items and trashfor its eventual disposal. 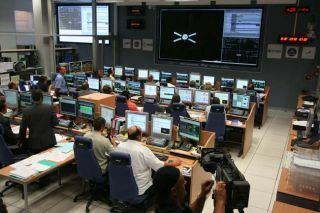 Thespacecraft performed so well, mission managers at a control center in Toulouse,France, extended its flight by one extra month. Jules Verne is slated to bedestroyed on Sept. 29 when it burns up during reentry over the Pacific Ocean. ?How theATV has performed highlights extremely well how the benchmark of European spacetechnology has been raised, and the wealth of expertise present in Europeanindustry," said Simonetta Di Pippo, ESA?s director of human spaceflight, in astatement. ?This bodes well, not only for future ATV missions to theInternational Space Station, but also for developments of this kind oftechnology that may eventually provide Europe with an autonomous cargo returncapability and independent access to space for European astronauts.? ESAofficials are providing at least five ATV cargo ships to resupplythe space station in return for launch services for its Columbus laboratorydelivered to the space station this year, as well as slots for Europeanastronauts on future long-duration missions to the orbital research lab. Jules Verneis the second cargo ship to leave the space station this week. The Russianspace freighter Progress 29 castoff from the station on Monday and will reenter the Earth?s atmosphere fordisposal next week. The nextATV is slated to fly in 2010 and will follow the debut of another space stationcargo ship, Japan?s H-2A Transfer Vehicle, set for next year. ?Eventhough our schedule has been very busy at the ATV Control Centre, I couldn?thave wished for a better mission," said Herv? C?me, ESA?s ATV Jules Verne leadmission director. ?And in just over three weeks, we will be looking forward tothe ATV 2 mission in 2010.?